APLORI’s academic authority resides in the Faculty of Natural Sciences of the University of Jos. The Institute was established in 2001 as a training and research outfit. It is located in the Amurum Forest Reserve in Laminga(Jos- East LGA) in a serene environment that is very conductive for teaching, learning and research. APLORI has teaching and research affiliations with a number foreign Universities and International environmental Organizations. A 24- hour power supply and reliable internet connection ensures high intellectual productivity among staff and students of the institute. Students admitted into APLORI’s M.Sc. programme usually enjoy some form of scholarship award. The course is designed for young Nigerian Biological Scientists with a craving for carrier opportunities in conservation of renewable natural resources. Qualified Applicants from elsewhere especially in West African are also welcome. Admission is opened to all holders of at least a Bachelor of Science Degree SECOND CLASS HONOURS (Lower Division) from a recognized university, in any of the following disciplines: Zoology, Biology, Botany, Forestryand /or wildlife, Wildlife Management, or any EnvironmentScience. In addition tot he above, candidates must posses a minimum of 5 credits (Including Mathematics and English) in O’Level WAEC SSCE. Aspiring students should visit the University of Jos website www.unijos.edu.ng and follow the link to purchase the form. For more information contact us on +2347032930199. Completed application forms together with an application letter containing the Applicant’s email address and telephone number must be returned to the institute before 1st July, 2014. Applications that do not contain all the requisite materials will not be processed. Shortlisted applicants will be invited for a combined written and oral interview. Please contact us at aploriapleventis@unijos.edu.ng for further enquiries. Update on the African Cuckoo tracking: #94 on the move! After over 4 months in the APLORI area, cuckoo #94 finally moved c. 370 km SE. Its current location is just south of Yola, Adamawa state, Nigeria and about 50 km to the Nigerian – Cameroon border. Whether this will be the first individual to migrate out of Nigeria is something to watch out for. After a seemingly long period of “busy silence”, it is time to update the story of our five satellite-tracked African Cuckoos. Let us now consider what has happened since the last blog. 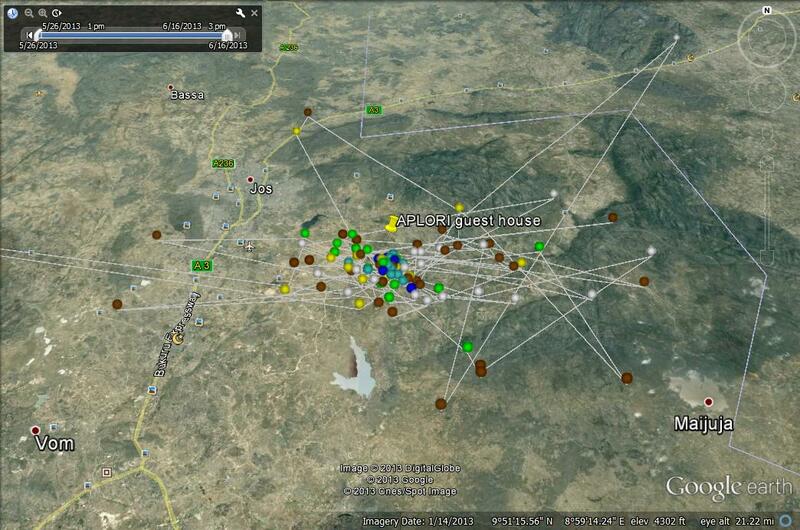 Cuckoos #94 and #96 are still within the Jos area. The two birds have spent most of their time, presumably foraging and breeding, between the Amurum Forest Reserve and neighboring villages and settlements. Cuckoo #95 stopped transmitting in mid-June. The failure of transmission is most likely due to failure of the transmitters. This is because efforts to find the bird from the place of last transmission were not successful. Also, the device transmitted for a short period about 2 weeks later from the same general area. It therefore seems that this individual may be flying about with a faulty transmitter. Cuckoo #97 has been the most adventurous individual. After spending a few weeks around the APLORI /Laminga/Kerker areas, in mid-June it flew towards Bassa Local Government Area of Plateau state where it spent about 1 week before moving towards the border of Plateau and Kaduna state to spend an additional 2 days. At the end of June, the bird then returned to the APLORI/Laminga/Kerker areas, stayed until mid-July before departed an area close to Toro, Bauchi State. On the 24 of September it had moved to another location about 100 km away. Cuckoo #98 stayed within the APLORI/Laminga/Kerker area until mid-August before moving to an area close to Toro, Bauchi State. Considering that this project started just at about the beginning of the rains, and also that two cuckoos are still around the general area where they were trapped, I speculate that the cuckoos may begin to show longer and clearer movements at the end of the rainy season in the Jos area. Also, given that Diederick cuckoos and Klaas’s cuckoos are currently still heard calling around the Amurum Forest Reserve, the prolonged stay of the two individuals may be in response to resources that are still abundant. Edu has successfully defended her PhD thesis titled “Consequences of bushmeat hunting in tropical forests” on March 1st2013 at Lund University, Sweden. Funding for her thesis was provided by grants from Sida, Kungliga Fysiografiska Sallskapet and Formas with support from Lund University, Cross River State Forestry Commission, A. P. Leventis Ornithological Research Institute, Jos and WCS. 5) on human reliance on forest resources and rural people use forest resources. Results from her thesis showed that primates (4-180 kg) were much rarer in hunted sites, while seed predators increased in abundance with hunting. Community composition of birds was similar in paired sites. Seedlings and adult tree composition were similar in protected sites. Abiotically dispersed species dominated in hunted sites and had a higher germination rate only in hunted sites. Seedling communities were significantly related to mammal communities. LNC and SSD increased with hunting but not LMA. Data from questionnaires administered in four villages in and around the Cross River National Park revealed an overwhelming reliance by households on forest resources for sustenance. Contrary to prevailing knowledge, the collection of food resources was the most widespread form of resource extraction and not bushmeat. More primate dispersed trees have utility for human compared trees with other dispersal modes. Results reveal a minimal effect of competition among seedlings rather that dispersal limitation and altered mammal community composition triggered by the decline of efficient seed dispersing vertebrates majorly mediate changes in seedling communities and that these changes are largely detrimental to forest conservation and human wellbeing. Staff and students resumed on 7th January 2013 after the Christmas break. Everyone is looking refreshed and teaching/research has since continued in earnest as we look forward to a wonderful year! The A. P. Leventis Ornithological Institute (APLORI) has produced yet another set of well-trained scientists. They rounded up their studies on the 12th of December 2012 with the presentation of their research findings to the External Examiner Dr. Andy Gosler and a host of other academic and research staff. This set is the 9th set of APLORI graduates. On Thursday 15th November 2012, APLORI celebrated its 10th year Anniversary of research and training in Conservation Biology with an emphasis in Ornithology. The Institute has so far trained 58 Masters and 5 PhD degrees, which are well groomed scientists, recognized both nationally and internationally. APLORI’s graduates are found in various institutions contributing their quota to the conservation of the world’s biodiversity. The highlights of the day included the presentation of the 3rd A. P. Leventis Annual Lecture and presentations from various APLORI graduates doing research in different fields of ecology.